Well, friends, I am excited to announce that today I begin a new “EdVenture”. I am thrilled to have been offered and accepted a position with Open Up Resources. A child’s zip code should not determine the quality of education they receive, nor should it determine the access educators have to curriculum and professional learning. Every child, everywhere, deserves and can receive a high quality, equitable literacy education with the support of OER (Open Education Resources) and evidence-based, high-yield instructional practices. This is why I am honored to join the team at Open Up Resources as the new ELA Community Manager and Professional Learning Associate. For the past 20 years, I have dedicated my life to education and literacy. Lifelong learning starts with a strong foundation in literacy, impacting a student’s personal, professional, and civic lives. Opportunities are opened and potential is realized when one can discern information with a critical eye and communicate their message effectively. As a classroom teacher and regional support consultant, I navigated the perils and success of literacy learning, honed my craft through professional learning communities, continued my education, and consulted research. Now, I begin a new chapter in the education field, continuing to advocate for high-quality literacy learning while supporting teachers and district leadership implementing the ELA curriculum from Open Up Resources across digital platforms and face to face. Technology not only changed my teaching but opened the world for my students. In 2008, I became a 1:1 laptop teacher, meaning, all of our students were given laptops to use during the school year. Because of this, I am a connected educator, blogger, and Tweet regularly. The connections I have made over the years have positively shaped me into the educator I am today. The sharing of resources, relationships made with educators across the globe, and the access to information are benefits I wish all teachers could capitalize upon. Along with these benefits, the growing awareness and use of OERs is an economical way for teachers to update content, differentiate in the classroom, and use, reuse, and redistribute material for all students. Part of my role will be growing and supporting educators implementing ELA Open Up Resources in their classrooms; EL Education K–5 Language Arts & Bookworms K–5 Reading and Writing. 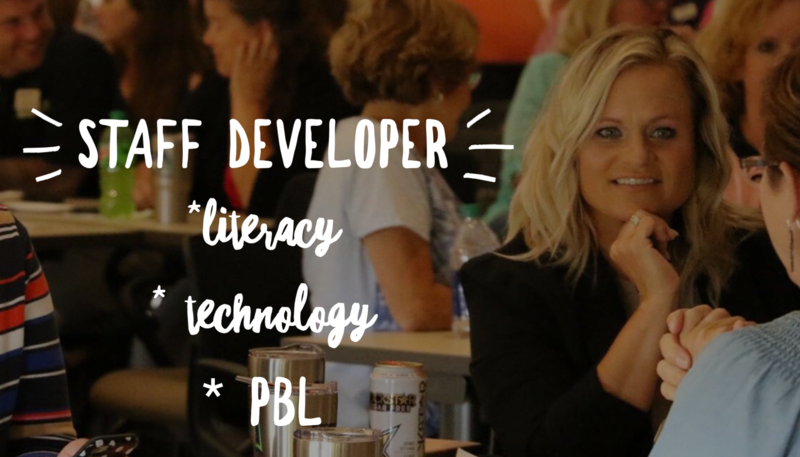 Through regular Twitter Chats #OpenUpELA, online webinars and book clubs, and communication through FB Communities I hope to connect educators across the nation with a focus on ELA and OER. Open Up Resources has a vibrant Math Community that is supported and led by my new colleague, Brooke Powers, if you are not following her on Twitter, do so now, she is amazing and I can’t wait to learn from her. The second part of my role will include Professional Learning. Collaboration with the team, designing and evaluating Professional Learning, and providing feedback from the implementing teachers; I hope to utilize my skill set and expertise to enhance literacy learning for ALL students. Our Mission: To increase equity in education by making excellent, top-rated curricula freely available to districts. Feel free to ask me anything about OER and the ELA or Math Curriculums we have at Open Up Resources, K-12 Literacy, or Technology in the Classroom. I would love to have a geek out session with you! Changing education is tough, why not do it with other passionate educators in your tribe? A huge shout out to the team at OUR who took a chance on me, time to roll up my sleeves and get to work. Opportunity to learn with renowned education researchers and practitioners rejuvenates the mind and reignites the passion in many educators. In the second of our two-part series, Steven Anderson and I share what we learned from the Visible Learning Institute in San Diego, this time with a focus on literacy. Head over to part one to see our initial thoughts and shares. The second day at the Visible Learning Institute in San Diego provided attendees choice in one of two paths in which to learn; literacy and math. Steven and I jumped at the chance to learn from Nancy Frey and chose the literacy learning to continue to grow our knowledge in this area for supporting educators around the globe. Frey and Doug Fisher (her colleague) have worked extensively with John Hattie in the realm of literacy practices and transferring his research into practice. They have multiple books with Hattie, two of our favorites being Visible Learning for Literacy Grades K-12 and Teaching Literacy in the Visible Learning Classroom, Grades 6-12. 12. Constrained and Unconstrained Skills – Constrained skills are those that have boundaries and edges to them and are acquired at concrete stages of development. These include phonemic awareness and phonics. Unconstrained skills are boundless, limitless and continue to grow throughout life. These include vocabulary and comprehension. While no argument can be made against the direct instruction and learning of constrained skills, Frey reminded us all that they are important but not sufficient. Leveled texts are great for learning constrained skills, but unconstrained skills are not developed through these types of texts. Both constrained and unconstrained skills develop independently; it is important for all educators in all subject areas to pay attention to both. Reading Volume – The amount one reads is important, but do you know how important it is for our students? Frey offered statistics to drive home the point about reading volume. Reading 20 minutes a day = 1,800,000 words per year & 90th percentile on standardized tests. Reading 5 minutes a day = 282,000 words per year & 50th percentile on standardized tests. Finally, a student who reads only 1 minute a day = 8,000 words per year & 10th percentile on standardized tests. Assumptions that all kids have access and time at home to read will not increase reading volume; instead, make time for students to read in your classroom. In addition, as Frey reinforced, students need both content specific reading but also need the exploration of texts beyond the content. If a student enjoys to pleasure read graphic novels we should not dissuade that student from choosing them. Rather, we should support them while still exposing them to content specific passages and texts. Surface, Deep, Transfer Learning – Hattie, Fisher, and Frey discuss a scale for learning and divide it up into 3 parts of a triangle. Surface, Deep, and Transfer Learning make up this scale representing learning as a process, not an event. Along with the description of each, Frey offered high-impact instructional strategies to support learning. Surface – Surface Learning, the base of the triangle, is learning that takes place during the acquisition of skills and understanding of concepts. Learners often recognize patterns and start to build foundational knowledge to support the next level of the triangle, Deep Learning. Deep – Deep Learning builds off of the Surface Learning students acquire. As Frey states, you have to know something before you are able to do something with that knowledge. Deep Learning consists of consolidation through connections, relationships, and schema to organize skills and concepts. Deep learning is also used to consolidate constrained and unconstrained skills. Students need more complex tasks to deepen their own learning. Transfer – Finally, learning and school should not stop with just Surface and Deep Learning. Transfer Learning is self-regulation to continue learning skills and content independent of the teacher. Frey admits, not everything we teach or learn is worthy of Transfer Learning. Transfer Learning places more responsibility on the learner to question, investigate, and organize to propel their learning. High-Impact Instructional Strategies to support Transfer Learning and the effect size.